Ground source heat pumps (GSHP) are becoming a mainstream option for those looking to efficiently heat and cool a building. This innovative water-based design showcased by our friends at Treehugger is a promising option for those lucky enough to have a body of water to plug their home into. 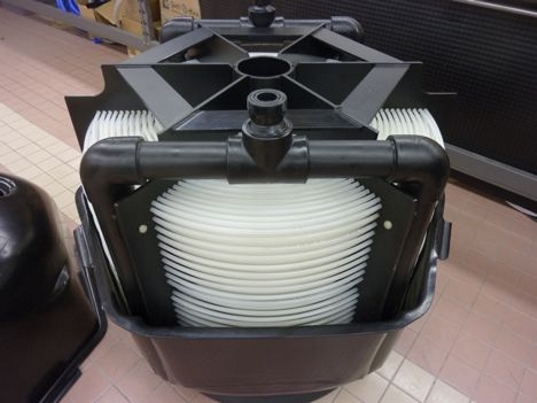 Rather than laying out a huge mat of loops on the lake bottom, the device condenses the heat exchanger into a relatively small package that lets water flow naturally through the capillary-like tubing. The LIMA 1‘s no-muss, no-fuss approach makes ground source or geoexchange heat pumps much more environmentally and economically viable. The unit takes full advantage of the incredible properties of water– its ability to hold and transfer heat, and the fact that it is readily available in many places. The current method of installing a system is to lace the bottom of a body of water with tubes — not the most elegant or low-impact approach. Servicing can be an issue as well, and installation costs can be staggering. The one-meter diameter Lima-1 uses a large series of short engineered tubes made from fluoropolymers that excel at heat transfer. The tubes are connected to a series of manifolds that are then connected to an inlet and outlet pipe. Non-toxic antifreeze runs through to a condenser, which efficiently transfers heat from the buildings heat exchanger with the body of water. The entire system has 1-600th the footprint of a typical system. The entire unit is set into the water and weighted down so it sits one meter above the bottom of the lakebed. Heat exchanges as water flows naturally through the chamber. While issues such as cleaning, service life, series installations, and use in a marine environment need to be explored, this simple idea has been a long time coming. Propylene glycol is a suitable non-toxic alternative, in fact, a permitted food additive. It is four times the price of the more common ethylene glycol, which is the member of the glycol family which interferes with a vertebrate enzyme system and is hence very toxic. The additional cost should be of little consequence for systems of this kind. Pity they used blue plastic pipe to connect with it down to the lake. Blue pipe signifies 'drinking water', but for a GSHP this would have a glycol/water (antifreeze) mixture in it, possibly fatal if accidentally drunk! Ground source heat pumps (GSHP) are becoming a mainstream option for those looking to efficiently heat and cool a building. This innovative water-based design showcased by our friends at Treehugger is a promising option for those lucky enough to have a body of water to plug their home into. 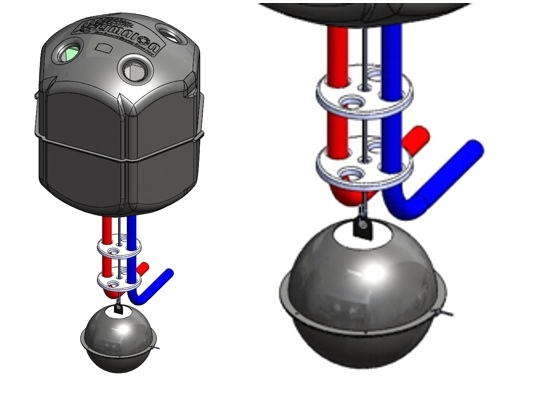 Rather than laying out a huge mat of loops on the lake bottom, the device condenses the heat exchanger into a relatively small package that lets water flow naturally through the capillary-like tubing. The LIMA 1's no-muss, no-fuss approach makes ground source or geoexchange heat pumps much more environmentally and economically viable.